For those in the know, the old ones are vastly powerful space gods, who evolved when the universe was in its infancy. Eons ago they were bound into the very fabric of reality in an attempt by the cosmic Angels and their allies to save the universe from oblivion. Occasionally, every million years or so, one of these beings is either freed or escapes from its interdimensional prison and wreaks havoc throughout the universe. The Old Ones should not be confused with Lovecraft's Great Old Ones, who are notably weaker. Although the most powerful of Lovecraft's Outer Gods would be considered Old Ones. Use of 'The Lady of Pain', 'Yog-Sothoth' and any others here is not done in the course of trade and is not intended as a challenge to any trademarks. A few things of note about the above table. 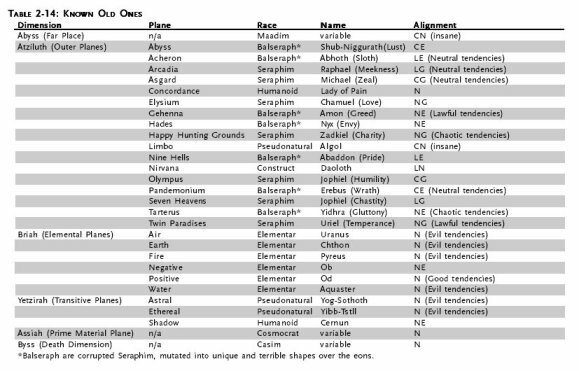 Its possible that further research may change my mind as to the the names of the old ones, in particular the Balseraph. I am also not totally convinced I have the seven virtues correctly corresponding to the appropriate angels. Likewise its tough getting an exact bead on which virtue or sin should be linked to which plane (although the Nine Hells is pretty obvious). Old ones outside the above list certainly exist, though they may not be linked to the planes themselves. e.g. The Moorcock gods Rhynn and Qwll roughly fit the profile of old ones who exist outside the cosmic balance.